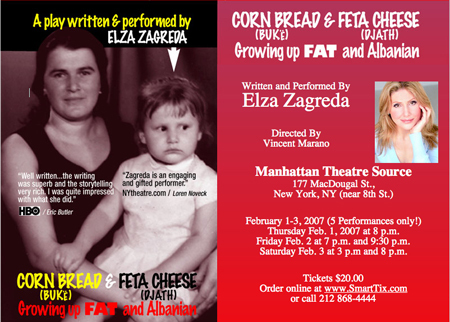 Corn Bread & Feta Cheese is my friend Elza Zagreda’s one woman show about growing up fat and Albanian. Although she is no longer fat, she is still hopelessly Albanian. Her looks and accent came in really handy when she played a Russian prostitute on Law & Order: Special Victims Unit. The show is good, I saw it last year. It’s been to Los Angeles where it was well received (meetings, lunches, agents, predatory men) and it’s back in New York City this Thursday, Friday and Saturday. It’s worth checking out. Reviews and the like can be found on her site.